Buko Loco by the Fruitas Group of Companies is introducing new flavors of coconut goodness that are closer to young, adventurous souls. Coco Strips makes the classic Buko Juice more flavorful and exciting to drink by adding fresh, real buko strips; while Coco Ube adds an exciting twist to the classic coconut juice as it’s infused with creamy ube flavor and adds nata crystals to make the drink more enjoyable. Young, adventurous individuals want more than just a drink that can keep them hydrated. What they want is a tasty yet healthy refreshment that can quench their thirst and give them energy for the day. And when it comes to keeping the body properly hydrated, buko juice has been a classic favorite for being a natural source of electrolytes. Thanks to Buko Loco of the Fruitas Group of Companies for making buko juice available in a bottle to suit the lifestyle of on-the-go young professionals or yuppies. 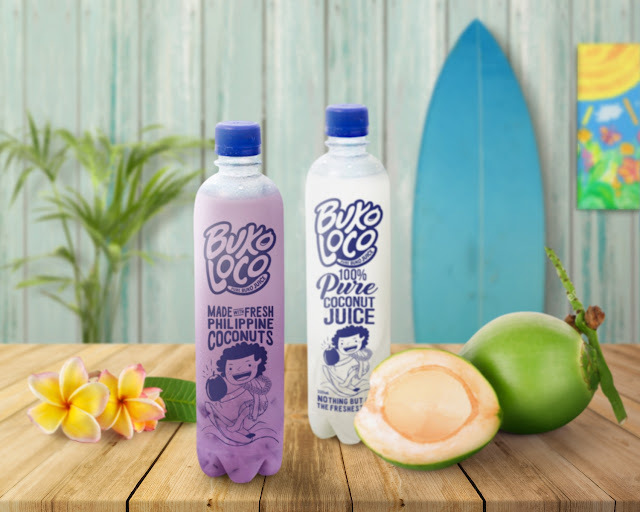 Now, Buko Loco is diversifying its famous bottled buko juice with a twist by introducing new flavors of coconut goodness, which are tasty, healthy and exciting. The Coco Strips and Coco Ube offer new buko juice experiences to meet the varied preferences of the Filipino youth. “At Buko Loco, we recognize that active and on-the-go yuppies do not settle for only one taste. They are adventurous with their choices and in need of diversity just like how they venture into a variety of outdoor activities. We want to complement this with a wider selection of flavors,” says Peter Carrillo, Marketing Manager of Fruitas Group of Companies. The first new offering is the Coco Strips, which adds fresh buko meat strips to the classic Buko Loco juice, making it tastier and even healthier. As the coconut water keeps the body hydrated and help nerves function well, the coconut meat helps restore oxidative tissue damage and is a great source of healthy fats, proteins and various vitamins and minerals. Meanwhile, Coco Ube makes flavored buko juices more appealing to those craving for a more adventurous local taste with its ube twist. The fresh and pure coconut juice is infused with creamy ube flavor, with nata crystals added to make the drink more enjoyable. It's not only tasty; it’s also good for the body as ube has antibacterial properties and is known to be a good source of carbohydrates. This drink can give adventurous souls more energy to keep them active throughout the day. “Buko Loco does not shy away from introducing twists to our buko juices. As the leading fresh buko juice player in the industry, we have introduced other flavor combinations such as Coco Milko with Nata Crystals, and Coco Pandan with Green Jello. With the addition of Coco Strips and Coco Ube, we are further diversifying our selection to further suit our products to the lifestyle of young Filipinos,” says Carrillo. Buko Loco’s Coco Strips is available in 330mL for only P 45.00 and in 500mL for P 55.00, while you can get Coco Ube in 330mL for only P49.00 and the 500mL for P 59.00. You can enjoy the coconut goodness of these new variants in all Buko Loco branches nationwide. The launch of Buko Loco’s Coco Strips and Coco Ube is made possible by the Fruitas Group of Companies, a leader in the food cart industry in the Philippines known for delivering fresh beverages, sweet fruit desserts and tasty snacks. For more updates on Buko Loco, you may follow them on Facebook (https://www.facebook.com/BukoLocoPH/). Fruitas Group is the leading group in the food cart industry in the Philippines. Since its first stall opened in 2002, the group now has over 800 profitable stores all over the country and close to 20 brands in its portfolio, which includes well-loved food concepts Fruitas fresh from Babot’s Farm, Fruitas Ice Candy, Black Pearl, Buko Loco, Juice Avenue, Friends Fries, the Mango Farm, Halo Halo Island, JohnnLemon, Cindy’s Candy Cloud and Fancie.